AN AUSTRALIAN gold mining company has been accused of contributing to the deaths of two locals by blocking access along a World War II track through remote Papua New Guinean mountains. In his book, Dirty Money: The True Cost of Australia’s Mineral Boom, author Matthew Benns claims armed guards have turned the Bulldog Track, 100km west of the famous Kokoda Track, into a no-go zone for locals. He said Papua New Guineans were angry they were being forced to take an alternative longer route that almost doubled the time of their trip through the mountains, and they blamed the mining consortium for the double tragedy. Benns claims local resident Gloria Thompson, who had been diagnosed with tuberculosis, died two weeks after taking the longer route to reach hospital in February this year. In 2010, a woman having complications giving birth, died after being carried for seven days over the longer route. Benns said she died 50m from a health care centre. The track, also known as the Bulldog-Wau road, was built in 1943 by a gang of more than 4000 Australian army engineers, cuts across the Owen Stanley Range and is regarded as steeper, tougher and wetter than the Kokoda Track. Since the end of its military use, locals from nearby villages had been using the Bulldog Track to access health care and supplies in the area’s larger townships. Locals have accused Australia’s Newcrest Mining and South African outfit Hidden Valley of closing the track. The companies, operating as Morobe Mining Joint Venture, argued the track was re-routed in the interests of public safety. Benns accuses the mining outfit of putting its interests ahead of the lives of locals. “The track was an amazing feat of engineering led by chief engineer W.J. Reinhold through some of the most rugged, mountainous landscapes of Papua New Guinea and that an Australian engineer managed to pull it off was his enduring legacy”. “Australian soldiers put their lives on the line to build this track. It was an astonishing feat. Newcrest’s former chief executive Ian Smith, who left the company this month, was credited with transforming the mining giant’s fortunes over his five-year tenure. The joint venture’s sustainability and external relations general manger David Wissink said talks were under way with locals and government officials about creating an additional alternative route. THE announcement by Bulolo MP and National Planning and Monitoring Minister Sam Basil in Lae last week to release business support grants totalling K3 million to certain landowner clans in the Wafi-Golpu gold mine could be in contempt of court, reports the Post Courier. That is the view of Martin Tepei, the chairman of the Piu Land Group Inc, which is a disputing party to an ongoing legal battle over ownership of the mine land. The Wafi-Golpu mine is predicted to be the country’s next biggest gold mine. Mr Basil declared last Wednesday that the funding would help principal landowners from Yanta, Hengabu, Babwaf and adjacent villages in the mine impact areas to prepare for negotiations. Mr Basil’s announcement was reported in The National last Friday and again on Wednesday. Minister Basil said the funding will come from the 2012 National Budget. He said respected Morobeans like Sir Nagora Bogan and provincial administrator Kemas Tomala would be asked to incorporate landowner companies and engage in negotiations with the government and the developer. “We have to treat everyone equally and properly and accord them the status they deserve as concerned groups,” Mr Basil was quoted as saying. But Mr Tapei said yesterday that the announcement could be in contempt of court as the ownership issue is still pending in court. On October 20, Justice Jacinta Murray had adjourned the hearing to November 11 to allow for the Babwaf clan, who are the party to the case, to amend their origin of summons against the State. Currently the Piu Land Group with 11 parties and three special Lands Title Commissioners (LTC) are challenging the NEC decision to revoke the special land title commission hearing into the Wafi-Golpu mine landownership. The three commissioners are Lawrence Titimur, Robert Irung and Richard Cherake. “The Wafi-Golpu landownership is still pending in court and not completed, and that Yanta, Hengabu and Babwaf are not recognised by the Land Title Commission as there is no decision yet been handed down by the three commissioners,” Mr Tapei said in a statement. He therefore asked Mr Basil or the National Government not to release the money until a legitimate landowner is independently identified by the LTC. “The Minister Sam Basil should not interfere with the landownership of Wafi-Golpu, but let the court to handle the matter in law, as it will be a contempt of court,” Mr Tapei added. He said he supported the business support grants but added it must only be released to the legitimate landowners declared by the court. A lawsuit filed by Bougainville residents against mining company, Rio Tinto has been revived by a U-S federal Appeals Court decision to throw out the lawsuit which alleges the mining company aided the PNG government in genocide and war crimes. The lawsuit was filed in 2002, 13-years after the mining company’s activities prompted a civil war in Bougainville. BERMAN: Well the ninth-circuit court of appeals agreed that the case could go forward allegedly that Rio Tinto was involved in the commission of war crimes and genocide, which are two international law recognised claims that are universal to all countries. COUTTS: Well what will you be asking for in this suit? BERMAN: We’re going to be asking for compensation to the ten-thousand or more people who are injured or killed during the uprising. COUTTS: How many people does that involve, how many people are you actually representing? BERMAN: Well it’s a proposed class action in the United States and in a class action you only need to name a few, the idea is you don’t want to bog the courts down with thousands of claims at once. So you have a few people represent the interests of class and the class in this case we think is about ten to 14-thousand people. COUTTS: Will you be getting testimony, because these are serious charges, genocide and all the other charges you’ve just listed, will you be getting personal testimony to back that up? BERMAN: Yes we already have some, we have affidavits from the former commander in chief and from a former prime minister that they were directed by Rio Tinto to take whatever steps were necessary, including violence and killing, to re-open the mine and they gave some details on that. But now we’re going to go and start getting the records and show in our view that Rio Tinto financed the helicopters and troop carriers and communications devices, and the means that the government used to try to suppress the uprising. COUTTS: And it also includes racial discimination and crimes against humanity all lumped in together? BERMAN: Well the court dismissed the racial discrimination and crimes against humanity claims, but the racial discimination claims kind of still falls within the genocide claims, so there’s not really a loss there. COUTTS: Can you just explain the point of that particular aspect of the case? BERMAN: Well the court found that racial discrimination under American law, the alien torch statute, someone can sue for a violation of international law, and the Supreme Court recently said those violations have to be laws that every nation, every civilised nation recognises. And believe it or not the court found that not all civilised nations recognise racial discrimination as a violation of the law. So they threw out the racial discrimination claim, on the other hand they said we did allege enough to suggest that the mining company looked at the Bougainvilleans as a separate people who they had no compunction or were not worried about polluting their environment, ruining their lifestyle, ruining their property and physically maiming them, and that was enough to state a claim. COUTTS: And some dissenting judges have protested against allowing a lawsuit to proceed in the federal courts brought by non-US residents against a non-US company. That is an interesting point? BERMAN: Well the mining company raised an issue as had other corporations that have been sued under this law that says the US should not be adjudicating claims against foreign companies where the acts take place for example, in this case they took place in Bougainville. But other courts, and the majority in this case said statute speaks very broadly and if you can get jurisdiction over the defendant, in this case Rio in the United States, then you’re entitled to bring the case here. And the historical notion we believe that underlies the law dates all the way back to piracy where a court, in that case piracy, which is what the act was passed to in part address, the idea was that someone commits a tort anywhere in the world, piracy is a universally condemned tort, if you catch that person in the United States you can sue them for that even if it occurred somewhere else, and that’s what’s happening here. And Rio Tinto has a huge presence in the United States, over 47 per cent of their assets or revenues are derived from North America, so the court found we had jurisdiction over them here and that’s why we’re sueing them in the United States. COUTTS: And is part of the claim too, because there’s been talk of mining beginning again in Bougainville, are you taking any action against that happening? BERMAN: We’re not, that’s not part of the case. But I’m told by my clients that Rio is trying to re-open the mine and there’s a pretty strong viewpoint, many people in the Bougainville area that Rio cannot and should not be permitted to re-open the mine until they address and redress the wrongdoing that they committed years ago. COUTTS: I.E. this court case? BERMAN: Right, I mean the mine is hugely valuable, copper prices have gone up and it’s a scarce resource and it was the world’s largest copper mine, still a lot of copper out there, it’s a valuable asset and they want it, but I don’t think they’re going to get it unless they remedy the wrongs that they’ve committed. COUTTS: When do you think you’ll get this case before the courts? BERMAN: Well now we’re going to go back down to the trial court and ask for discovery taking their testimony to proceed, I suspect that Rio’s going to ask the US Supreme Court to hear this case. Timely move to make miners more responsible for the damage they cause – or just more PR spin? Andrew Hewett, Executive Director of Oxfam Australia, says poor countries can expect greater control of mining companies under a new initiative to be launched by the Australian government, but until it proves effective in controlling the behaviour of mining companies operating in PNG we should be sceptical both of the motives of the Australians and the effectiveness of their initiative. There is no doubt that mining can stimulate economic growth and bring prosperity. But without a commitment to human rights and sustainability, and without regulation, transparency and accountability, it can also cause people to lose their land and way of life, while irreparably damaging the environment. With two-thirds of the world’s poorest people living in resource-rich countries, too often the extraction of those resources contributes to poverty, corruption and conflict. Australian mining companies have become embroiled in damaging behaviour far from our shores and attention. This week at CHOGM, the federal government announced initiatives aimed at ensuring the mining sector is better able to contribute to community and social development, and the responsible management of taxes and royalties paid by mining companies to governments, in Australia and overseas. These initiatives should provide some comfort to communities in poor countries, such as Indonesia, Papua New Guinea, Mongolia and many African nations – where Australian companies operate – as they struggle to get a fair share of their resource wealth, get access to essential services and protect their land and livelihoods. The government’s Mining for Development Initiative brings greater attention to mining governance and opportunities for government, companies and communities to work together on issues.. The International Mining for Development Centre, for example, aims to build capacity in governance and regulation, community and environmental sustainability and operational effectiveness and safety. The involvement of the Sustainable Minerals Institute at the University of Queensland should ensure a focus on mining’s social impact. A focus on the social impact of mining is vital. One of the worst examples of how things go wrong is the case of former Australian company Anvil Mining in the Democratic Republic of Congo. It is alleged that the company, by providing logistical help, played a role in human rights abuses, including the massacre by the Congolese military of more than 70 people in 2004. We have long needed greater assurances that Australian mining companies are adequately meeting their responsibilities in the developing countries in which many of them operate. The government’s emphasis on engaging with communities, promoting transparency, supporting partnerships, and building skills and knowledge in support of international best practice, announced just this week, is spot-on. For example, the Community and Social Development Program will help ensure a stronger focus on social and environmental responsibility in developing countries, and encourage the benefits of mining to be shard more equitably. It will help citizens hold mining companies and governments to account for promises made and could help guard against some of the negative effects of mining. On top of this, a focus on revenue transparency is long overdue. The government yesterday announced the establishment of the Extractive Industry Transparency Initiative pilot – a global standard for managing revenue from natural resources that requires companies to publish what they pay in taxes, royalties and other payments to governments, and for governments to publish what they receive. Implementing the EITI here will support global commitments to fight bribery and corruption, and will send a positive signal to other resource-rich, but often regulatory poor, countries. Here, it will allow Australians to access information on the value of our natural resources. The more those affected by mining, such as indigenous communities, know about payments made to governments, the greater the likelihood they can negotiate equitable benefit-sharing agreements. These initiatives have come at a crucial time, as soaring commodity prices contribute to record profits and fuel an increased appetite for risk and business in emerging economies and weak governance zones. Relying on companies to do the right thing is not enough. These initiatives will send a positive international signal, should improve business practice and enable communities and governments in developing countries to participate in development decisions that affect them. We will not take away all the guns. But there needs to be a priority set by the government in getting those arms out before the reopening of the Panguna Mine. Whether the world’s largest open-cut mine on this island territory of Papua New Guinea will resume copper and gold production, after being mothballed for 22 years, will depend on how satisfied matrilineal landowners are with the proposals. The women landowners are already raising issues about the potential impact on their land and communities if copper mining resumes at the site in the central mountainous district of Panguna. The Panguna copper mine opened in 1969 when Bougainville was under Australian colonial administration and customary landowners were excluded from the Bougainville Copper Agreement between the Australian government and the mining company, Conzinc Rio Tinto Australia. For 20 years, the Barapang, Kurabang, Basikang and Bakoringku clans, customary landowners of the mine pit, endured devastation of their land and waterways by waste from what was the mine, community evictions and negligible share in profits. 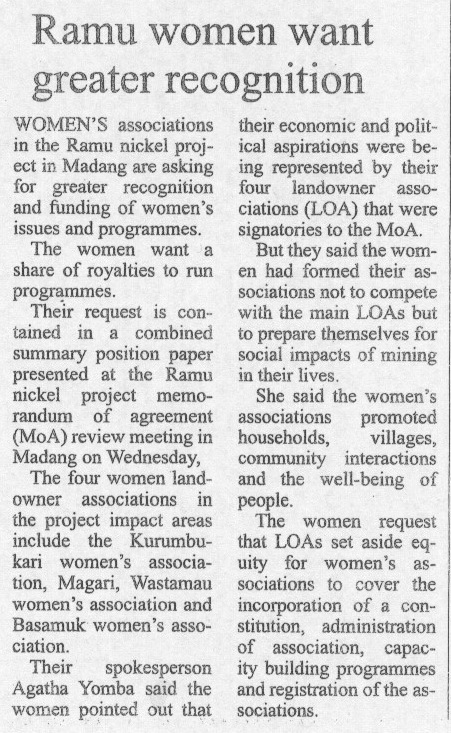 In 1989, following BCL’s refusal to pay the landowners’ demand of 10 billion kina (454 million dollars) compensation, the Bougainville Revolutionary Army (BRA) forced the mine to close. The PNG government, a major owner (19.06 percent) of the operating company, Bougainville Copper Ltd (BCL), alongside British multinational, Rio Tinto (53.58 percent), imposed a blockade on the island and a 10-year civil war followed during which 20,000 people died, communities suffered human rights abuses and infrastructure was destroyed. Helen Hakena, director of the Leitana Nehan Women’s Development Agency, a local NGO, counsels women victims of violence and develops leadership capacity and awareness of land rights in communities. She said a significant achievement since the 2001 Bougainville Peace Agreement was the formation of the Autonomous Bougainville Government (ABG) in 2005. However, the population of Bougainville has doubled from 175,000 in 2000 to over 300,000 now, and with the island’s current revenue deriving mainly from international aid donors, public services remain limited. Many villages lack electricity, clean water and adequate medical services. The ABG views potential mining revenues as vital to developing services and attaining economic self-sufficiency for the second pillar of the Peace Agreement, a referendum on independence from PNG within the next 5-10 years. In May, BCL chairman Peter Taylor visited Bougainville with a business delegation and held preliminary discussions with Bougainville President John Morris about reopening the Panguna mine, which the company estimates has reserves of 3.5 million tonnes of copper and 12.7 million ounces of gold. Taylor stated publicly that he expects the ABG and landowners to lead in mining negotiations. However, women landowners remain concerned that the customary value of land as a source of livelihood will give way to corporate interests that see land as an expendable resource. The women say the economic potential of local industries, such as cocoa, copra and tourism must be fully explored first and unresolved issues, following the mine’s abandonment, must be addressed, including financial compensation and environmental damage. “The first thing, the government and the company, they have to pay that 10 billion kina, which is part of the (landowners’) demands, then the killings and the damage has to be paid. Then we talk about the mining issue,” said Panguna landowner Lynette Ona. “The chemicals are still there in the river,” she said. “No one drinks the water, there is no fish there, it is still the same,” said Ona who promotes the participation of women in local politics and plans to be candidate in the 2012 Bougainville elections. An environmental report on the Panguna mine by Applied Geology Associates (1998) spoke of thousands of tonnes of tailings including toxic metals such as mercury, lead and zinc. Tailings flowing into the nearby Jaba river decimated fish and contaminated water supplies and crops. Long-term political and social unity is also a key issue with reconciliation and weapons disposal incomplete. A survey, supported by PNG’s ‘Post Courier’ newspaper, of 500 families in Central Bougainville affected by the civil war death toll of 1,629, showed households still in possession of weapons. However, a decision on whether the mine will reopen is still to be made by the ABG, landowners, the PNG government and BCL. ABG’s chief mining officer, Stephen Burain, said new mining laws were being drafted with assistance from the World Bank, but a review of the Bougainville Copper Agreement, a precondition to mine negotiations, awaits unification of all landowners in mining affected areas under the Panguna Landowners Association and an independent environmental audit made. The Panguna community also includes the Mekamui hardliners, comprising many former BRA fighters, who control access to the Panguna mine and have not yet agreed to any mining proposals. What is clear is that the mine’s future is in the hands of Bougainville people who want to see strategies of economic development that preserve human rights, social cohesion, environment and culture. “We want to develop, but to redevelop from the mistakes, not to repeat the mistakes (of the past),” said Tapakau. Lawyers are hoping to prepare a new law within three years to protect Pacific marine environments, including those of Papua New Guinea, from possible damage caused by new deep-sea mining projects, Radio Australia reported on Monday. Deep seabed minerals had the potential to be a major economic resource for PNG and other countries across the Pacific but there had been growing concerns about the lack of laws governing the practice. Canadian explorer Nautilus Minerals planned to have the world’s first seabed mining project, Solwara1, in waters off PNG’s New Ireland and East New Britain provinces, which was expected to begin in 2014. And Tonga and Nauru had sought exploration licences in international waters in the east Pacific through their sponsorship of companies Tonga Offshore Mining Ltd and Nauru Offshore Resources Inc, Radio Australia reported. Nautilus also had sea floor exploration leases in the Solomon Islands, Vanuatu, Fiji and New Zealand. Radio Australia said that Hannah Lily, a lawyer for the Secretariat of the Pacific Community’s Deep Sea Minerals Project, was working with 15 Pacific nations, including PNG, to establish the regional framework before mining begins. Lily told the radio’s Pacific Beat that a regional standard would be developed that every country could agree to. “That’s why I am really looking forward to working with the government and legal communities to ensure that what each country ends up with suits their context and it will be quite different for each. Commenting on this yesterday, Nautilus Minerals PNG country manager Mel Togolo said Nautilus Minerals was leading the world in the development of the seafloor resources industry, which had the potential to deliver major economic benefits to countries in the Western Pacific and elsewhere. “As the industry leader, we are very conscious of the need to ensure that we work with governments in the region to develop a regulatory framework that fosters the growth of the industry in a way that is economically, socially and environmentally sustainable,” he said. “We have been working with governments in the region, and at a global level through the International Seabed Authority, to develop that framework, and we have been making excellent progress. “We are grateful for the work of people like Hannah Lily and others, who recognise the great potential of the industry to lift the standard of living in the region and create lasting benefits for future generations”. The government this year granted the seabed mining licence to Nautilus Minerals for the Solwara1 project, about 50km north of Rabaul, saying that it would take its full 30% stake in the project – about US$103 million. In what will be the first in the world, Solwara1 was expected to to produce around 800,000 tonnes of copper and up to 200,000 ounces of gold a year.